Please find the regulations regarding ticket refunds for each of your flights below. Remember that the most restrictive conditions of the fares that you bought will apply. In the event that you request a refund, we will deduct the highest penalty fee of the entire trip. Although your trip may not allow a refund you are entitled to request the return of the boarding fees. Please remember that in some countries there is a service charge and that this amount is not refundable. You can request ticket refunds in the Servicios de LAN.com section. For the fare: QLESPD6Y/DD20 of the family Base Refunds are permitted with a charge of US$200.00 . Refunds for tickets that have been partially used: It will be refunded with the difference between the value of the original ticket and the cost of the trip actually flown, minus the corresponding refund charge. However when I called today to cancel the flight the LAN customer care insists that the fare is non-refundable... Any advice? @Trufa the part I quoted comes from the section "Refunds" in my ticket receipt. See below. 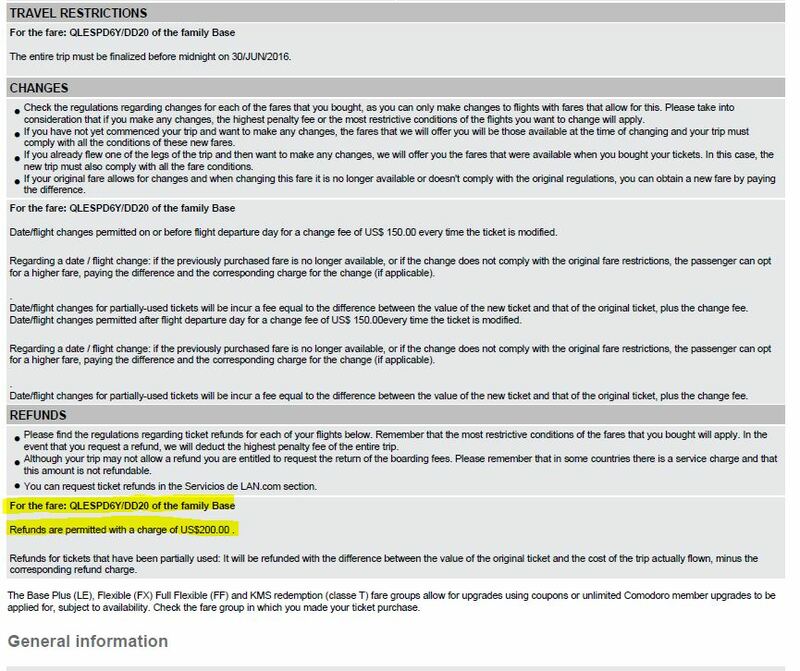 I am not sure if it is consistent with what I see in the notes of the ticket, that is why I was asking for the meaning of the code: NONEND-REF/CHG SEE PENALTY (see also below) The call center said something about that being the case if the ticket was originated in BR but since it originates in US it is non-refundable. I wonder what is the legal basis of this since everything from the web site where I bought the ticket to the receipt I got states the ticket is refundable with $200 fee. Any advice is welcome. These are technical terms that are not intended for interpretation by the customer. Disclaimer: I am subcontracted by LAN, this is just my personal attempt to help the OP and not an official answer. I think you cut the purchase receipt's quote too early. Here is an example purchase receipt. (Sorry, couldn't find one in english, you can find yours here but I guess you already have it). If there there it says that it doesn't allow refunds, unfortunately there isn't much you can do as far as I'm aware. You could always contact the call center and insist since they are the ones that know the nooks and crannies and might help you find an exception if there is one, but I doubt so, nothing lost for trying though. Not the answer you're looking for? Browse other questions tagged air-travel cancellations disputes or ask your own question.